If Matt Chan’s second-place finish at this year’s CrossFit Games was a surprise, it shouldn’t have been. Indeed, Chan finished eighth in 2008, 18th in 2009, fourth in 2010 and 10th in 2011. Chan has consistently been a contender, but he wasn’t able to make the podium until 2012. What might be surprising is that Chan gave up on programming for himself in 2012 and employed a coach, Joe Alexander, to get him to the next level. I have got to say I was not suprised at Matt Chan's success this year. I met Matt and Joe Alexander at the Level 1 Cert in Dallas this year, I was blown away at Matt's physical presence and confidence. 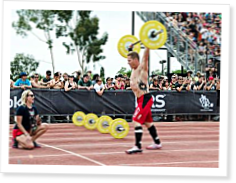 He shared with me that he believed Kelly Starrett to be one of the most valuable resources that Crossfitters have available, and after seeing his results and his mobility in the games I would have to agree. Matt chosing Joe Alexander was in my estimation the best choice he could have made. I also met Joe at the Cert and he was an enormous help (along with Cherie Chan) with my knee injury by scaling and encouragin me through "Fran" and other challenges at the Cert. (I was the "old guy"). My hat is off to the two of you.....keep it up and see you on the podium next year!! Matt is a great athlete, amazing coach, but better person. We at Verve are lucky to have him. I found the following paragraph to be very interesting in this article. Hey I just wanted to introduce myself. I'm Brett Tolbert with BOX.EVENTS. I read this article and feel very inspired. I just want to say - Way to go Matt! You are an inspiration to people like me. I wonder if you ever plan on programming again? You could really do a lot with that and your experience as a CrossFit athlete. Anyway, thanks for the inspiration. Congrats again Matt.